UTC+08:45 is an identifier for a time offset from UTC of +08:45. UTC+08:45 is used as a time in Australia (Central Western Time, or CWT). It is used by some roadhouses along the Eyre Highway in Western Australia and South Australia. Although it is not an official, government mandated timezone, the boundaries where it commences and ends are clearly defined and are frequently shown on road maps of the area. Signs at the western end of the time zone on the Eyre Highway advise travellers to reset their clocks by 45 minutes. 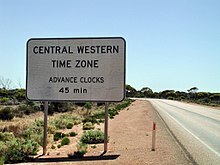 UTC+08:45 is used in 5 places in Australia, including Border Village in South Australia, as well as Cocklebiddy, Eucla, Madura and Mundrabilla in Western Australia. It runs from the border with South Australia to shortly east of Caiguna. It is included in the tz database with designator Australia/Eucla. ^ "Time". Australian Government Website. Government of Australia. Retrieved 25 June 2015. ^ "Annual Report 2012–2013" (PDF). Shire of Dundas. Shire of Dundas (WA). p. 7. Archived from the original (PDF) on 4 March 2015. Retrieved 3 September 2017.